The Mid-Atlantic N.A.M.E. Scholarship Foundation, Inc., was formed in February 1977 and provides financial assistance to qualified students majoring in advertising (with an expressed interest in newspaper advertising) at a recognized college or university. Marketing/advertising college students in the mid-Atlantic region are invited to enter the 2019 Mid-Atlantic N.A.M.E. 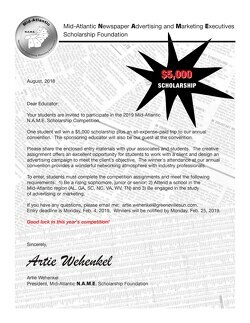 Scholarship Competition to win a $5,000 scholarship and an all-expense-paid trip to the annual convention. Click below for more information and application. Entry deadline is Monday, Feb. 4, 2019.